James R. Campbell, Minnesota Ballpark Authority: Retired Group Executive Vice President Wells Fargo and Company and Chairman and CEO of Wells Fargo Bank Minnesota, his career in financial services spanning 38 years. Jim also served as interim Dean of the Carlson School of Management at the University of Minnesota and is a past chairman and member of the Carlson School’s Board of Overseers. 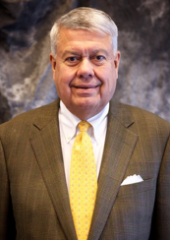 He has been extensively involved in many community, non-profit and educational organizations including Chairman of the University of Minnesota Foundation, Chairman of the Greater Twin Cities United Way and Abbott-Northwestern Hospital Boards. He has served on the boards of the Minneapolis Institute of Art, Allina, Junior Achievement, the Minneapolis Foundation, and Children’s Home Society. He is currently a trustee of Westminster Presbyterian Church and is a Board member of the Destination Medical Center Corporation in Rochester, MN. Appointed to the Minnesota Ballpark Authority by the Hennepin County Board of Commissioners in 2016.